CARTERET COUNTY – The Crystal Coast Stargazers Club members set up their telescopes and bring out the binoculars several times a month at various spots throughout the county in hopes of seeing the spectacular in the night sky. 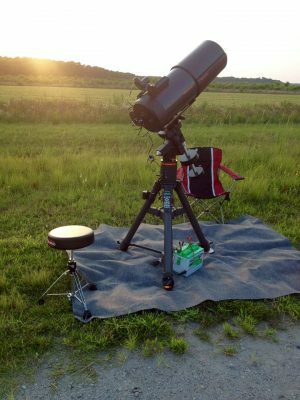 Lisa Pelletier-Harman of Morehead City, a club member and avid astronomer, said a handful of enthusiasts began meeting about a year ago. The club now has a membership of about 150 and is growing. Pelletier-Harman explained that the club has regularly scheduled meetings and get-togethers, plus the occasional special event. Fort Macon State Park and Cape Lookout National Seashore have monthly astronomy nights that the club members attend, there is a monthly social meeting at the Earle W. Webb Jr. Memorial Library and Civic Center, “The Webb Library” in downtown Morehead City, and they meet at the North River Wetlands Preserve in Otway, their dark sky location, each month on the Friday closest to the new moon. 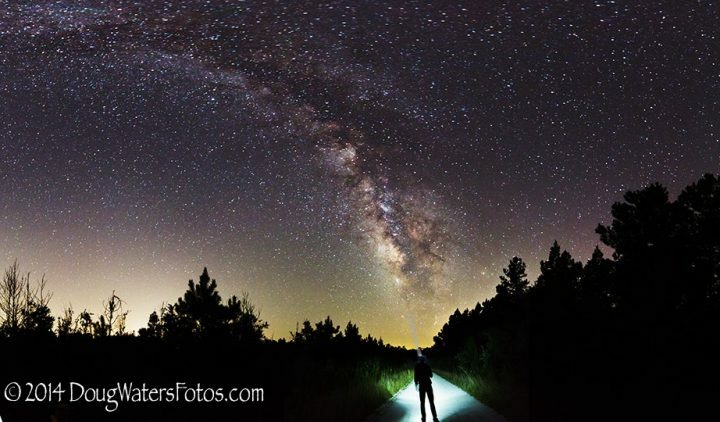 “My favorite is the dark sky location on the North River Wetlands Preserve. It’s amazing,” she said. 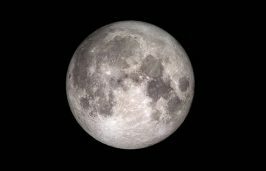 While the September meeting for the club at Fort Macon Sept. 15 has already been held, the next Dark Sky night in Otway is at 7 p.m. Sept. 22. The site is near the turn for Harkers Island on N.C. 70 in Otway. 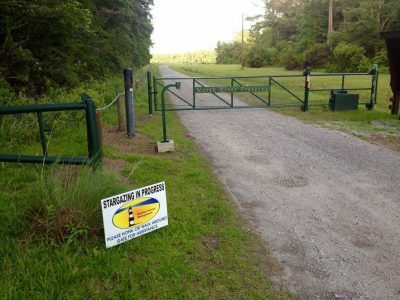 Look for the white sign for North River Wetlands Preserve, which the North Carolina Coastal Federation has granted the club permission to use for stargazing. All events are free to the public, but the club must have a signed release form on the visitor’s first visit. There is a special event this month, as well. 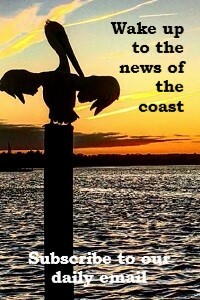 The club is celebrating Fall Astronomy Day Sept. 30 at Grayden Paul Park on Front Street in Beaufort. “We accommodate everyone who enjoys the night sky, from visual viewers to binoculars to rigs that would make the Hubble proud and everything in between. We also have a lot of photographers who enjoy and learn about astrophotography,” Pelletier-Harman said. 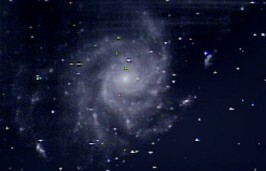 The club also has telescopes, or scopes, to loan out, set up for those who want to wander around the sky, she added. Pelletier-Harman said the club encourages people with no prior knowledge or equipment to join. “We have plenty of equipment to share and tons of knowledge to swap to make the learning curve easier and less intimidating. We also have a lot of fun and laughter,” she added. “We do a lot of outreach and are in the process of getting our accreditation to represent NASA, so we can go into local schools and other organizations to share our love of astronomy and hand out some cool swag,” she continued. They also have a couple of club members who are in the process of becoming NASA Ambassadors. Also an organizer for the Buddy Pelletier Surfing Foundation and former president of the Carteret County Historical Society, Pelletier-Harman said she has a soft spot when it comes to kids and trying to ignite their curiosity about the world around them. 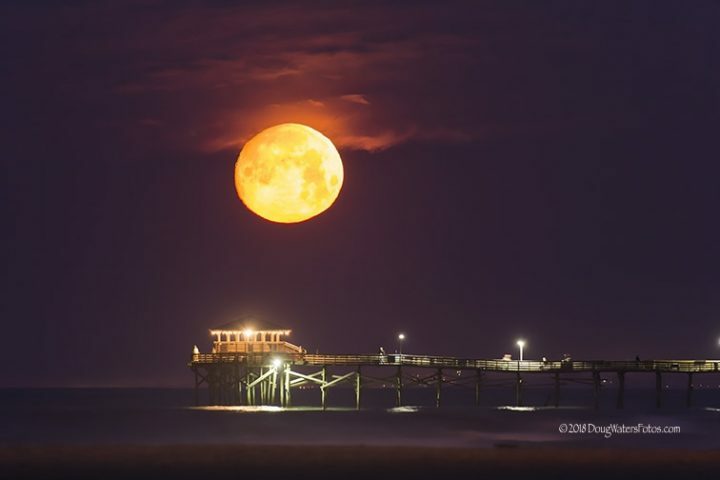 Club member David Heflin, of Harkers Island, explained that Fort Macon State Park Ranger Paul Terry, who hosts the monthly Astronomy Night at the park’s bathhouse, is the reason the club first got together. Terry said that he has been leading astronomy programs at Fort Macon for the last four years and tries to hold one event a month. The stargazers club has been extremely helpful during the last year that they have been around, he added. Terry recalled that one of the more interesting views they had as a group was the transit of Mercury on May 6, 2016. Heflin said he’s been an amateur astronomer since he was given his first telescope in 1967. He moved to Carteret County in 2015 after retiring, and began attending Fort Macon’s astronomy event. He and the regulars started discussing putting together an astronomy club. Heflin said he collected names at the monthly astronomy events at Fort Macon and, after about a year, had enough folks interested in meeting. The group first began meeting around a year ago at the Webb Library and now produces a newsletter that reaches about 100 people. For the Fall Astronomy Day, Sept. 30 at Grayden Paul Park in Beaufort, Heflin said they plan to meet there that evening, weather permitting, to view the night sky. He said the idea for sidewalk astronomy sprouted after attending a seminar where a representative from the Smithsonian Institution shared some insight on viewing the night sky in an area with heavy light pollution, like Washington, D.C., where the Smithsonian is located. Heflin said they’ll also take donations of unused telescopes, which they will refurbish or repair, if necessary. 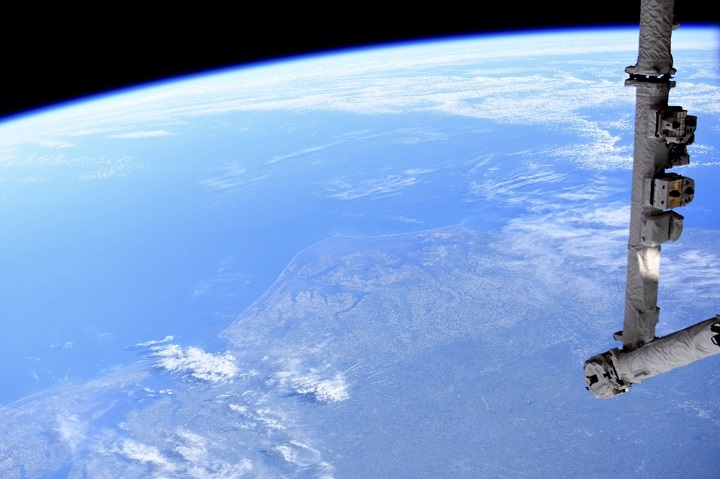 The group of astronomers are happy to volunteer their time to coordinate special event for schools, groups and organizations, according to the website. The event will be customized to the group’s experience, location and needs. To find out where events are taking place, join the Facebook group or the mailing list for monthly updates and schedules.